Belmont is a historic ghost town in Central Nevada along the eastern edge of the Toquima Mountains and the southern end of the Monitor Valley. 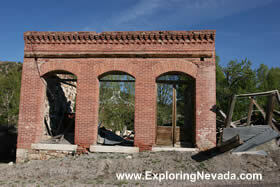 Unlike many other old Nevada mining towns, numerous buildings still stand in Belmont. Also located in Belmont is the historic Belmont Courthouse, which is part of the Belmont Courthouse State Historic Park. Belmont began life in 1865 with the discovery of silver nearby. The town thrived and within two years, the population had swelled to over 4000 people. However, like most other Nevada mining towns, Belmont’s fortune was tied to the fate of the nearby mines. As several of the mines closed, residents and businesses started to leave. By 1890 most residents and businesses had left town. Then in 1905 the county seat of the county was relocated from Belmont to Tonopah, sealing the town’s fate. The location of Belmont is very remote, thus requiring a bit of effort by a traveler to reach. Yet as one of the best-preserved ghost towns in Nevada, the effort required to reach Belmont is well worth it. The town is full of historic ruins and artifacts. Anyone who enjoys ghost towns and historic sites will enjoy a trip to Belmont. Belmont also has a beautiful location. The Toquima Mountains rise steeply outside of town. The southern end of the beautiful Monitor Valley Scenic Drive begins in Belmont. In addition, unlike many other Nevada ghost towns, Belmont doesn’t sit out in the middle of the desert but instead lies in a forested area. Belmont is located close to nothing. Tonopah lies about forty-five miles to the south while Eureka and Austin are located more than 100 miles away to the north. The tiny town of Manhattan is just twenty miles away, however, Manhattan has little in the way of services. Bring your tent or camper, as there is no lodging available (at least most of the year). There might be a bed and breakfast there, the Belmont Inn, but I'm no longer sure if it is still open for business (the website for it is gone).